Farmer’s Markets are for the kids too!! We love food. We like to talk with other people who like food. My boys are learning this as well. Where do they learn about food, and how it gets from farm to table? The farmer’s market. Before we even get to the parking spot, there is talk about what items we need for our grocery list, what we are hoping to find, and the required reminders about limits: hold a hand, use walking feet, ask before touching anything. They each get some money to spend. We supplement their amount, since they aren’t aware of the value of money yet, they see it as a trade. When they have used their money, they are done. Right now that means one trade. Later, it will mean learning about money value and the math involved. When making their “deal” they ask about the food. L1’s favorite right now is bread. He asks for bread based on the meal he wants it with. “I want toast,” “For spaghetti,” or “I eat it now.” The baker we visit makes the suggestion and tells them what is in it. L2’s favorite thing is fruit. And right now, berries. I swear he has one particular market gal bewitched. He is just sooo darn cute, and she loves such a little boy asking for “boo berry,” “tawberry” or just “THAT ONE!” and she is always good at addressing him and listening. I love that my children are gaining this opportunity to start talking about their food this way. I am glad to have a place to teach them about product value (and soon, about money). To learn courtesy and conversation skills. To have a place where more often than not the people treat my children as “real people” whose needs and wants are just as valid as the next customer. I also love the FOOD we get! And the lovely recipes that come from our pickings. 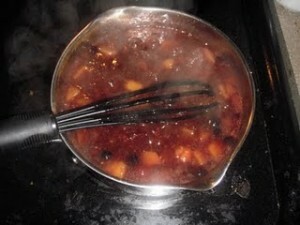 Cook peaches and berries over medium high heat to start juice release. Add water and sugar, bring to boil. Let boil about 4 minutes. In separate cup mix equal parts cornstarch and water until consistent. 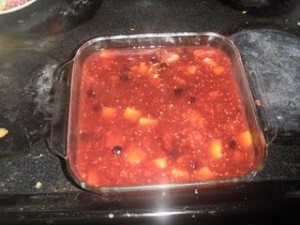 Add to fruit and cook for 5 minutes. Pour into casserole dish and place in fridge to cool. 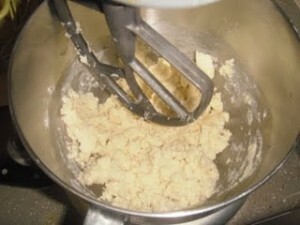 In mixing bowl combine flour, sugar, salt and baking powder. Cube butter, add a couple at a time while mixing at low speed. Slowly drizzle milk until crumbs form. Chill in fridge. 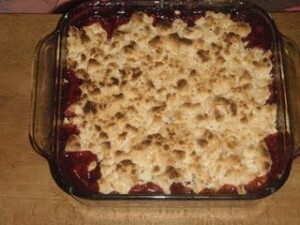 When chilled, sprinkle crumbs over fruit mixture and bake at 425 until browned, about 10 minutes. 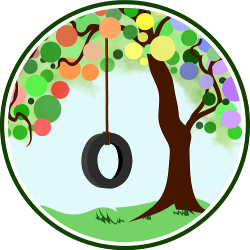 Jennifer is mom to two boys 23 months apart, and another on the way, she is a strong advocate of natural parenting and treating children with respect and kindness. Jennifer co-authors one blog with her oldest boy, Little View of a Big World and writes her own, True Confessions of a Real Mommy. To see what deliciousness we had for dinner before this lovely desert, head on over to True Confessions of a Real Mommy.